The Patriots and Rams played in Super Bowl 53. Both teams were coming off huge overtime wins that dealt with a couple of controversial calls. Fans around the nation, especially Saints fans, were outraged after a missed penalty held New Orleans out of the championship game. On the other hand, the Patriots were coming off an overtime win against the Chiefs where Tom Brady drove them down the field at the beginning of overtime and scored to end the game. Both the Patriots and Rams were the highest scoring teams throughout the postseason but this was one of the lowest scoring Super Bowls ever. After the first quarter the score the score was still locked up at zero. Early in the second quarter, the Patriots scored the first points of the game off of a Gostkowski field goal to make the score 3-0. The Rams offensively could not get anything going as they had under 100 total yards going into halftime. In the third quarter, both offenses continued to struggle moving the ball down the field but with two minutes left the Rams kicked a field goal to tie up the game going into the final quarter. Both defenses played tremendously throughout the game but Tom Brady and the Patriots drove down the field with seven minutes and scored a touchdown to make it 10-3. Ultimately, in this defensive battle, the Patriots came out on top after intercepting a Jared Goff throw on the final drive. Senior Adam Hascher said, “That was one of the most boring Super Bowls because there wasn’t a lot of scoring”. 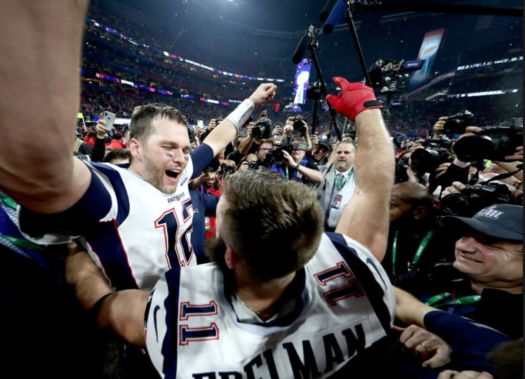 Patriots wide receiver Julian Edelman won MVP of the game with 10 receptions for 141 yards and Tom Brady is now 6-3 in Super Bowl games. 41-year old Tom Brady has more Super Bowl wins than 30 of the NFL teams.